The fall temperatures are upon us and we just had our first cold front move through Orange Beach this weekend. The morning air was crisp and a comfortable 64 degrees. 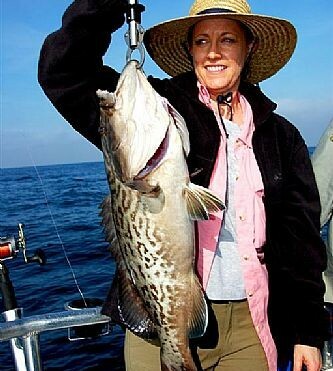 This makes ideal fishing for Gag Grouper on the Alabama Gulf Coast. The recent tropical storm and hurricane Isaac has pushed some groupers around and they are showing up on reefs that are usually occupied with mostly Red Snapper. These fish are a target species on our 10 hour trips or longer because of the time it takes to get far enough offshore to more favorable areas of natural bottom and artificial reefs. If you are planning on coming fishing with Distraction Charters this fall, be sure to book a 10 hour trip so you can have a chance to catch some grouper.